When you’re a freelancer, you trade in having a boss and coworkers for more freedom over your schedule and the type of work you do. However, you also trade in any corporate-sponsored training you may have had! 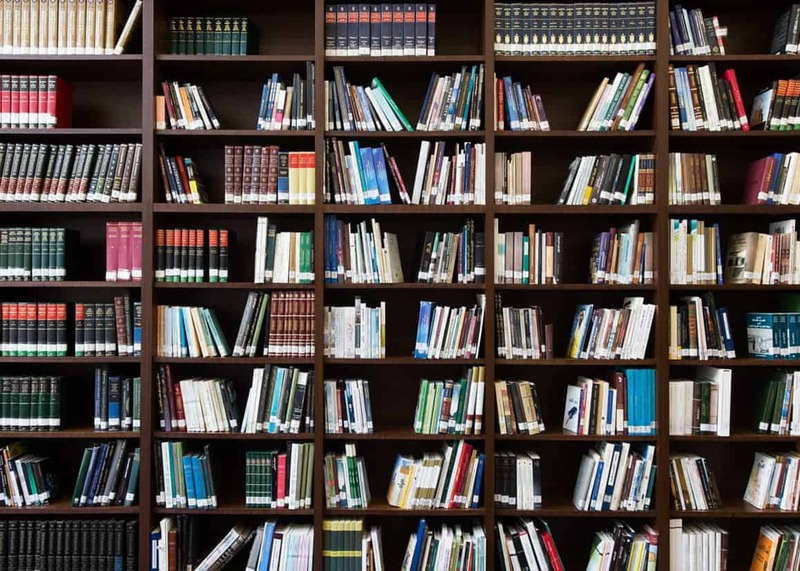 You have to be proactive in finding your own education and productivity resources – and that’s where this list of the best Udemy courses for freelancers comes in. Udemy is a website that hosts courses you can purchase. It boasts over 65,000 online courses made by expert instructors. Once you purchase a course, you get lifetimes access to the material, so you can learn at your own pace. You can even access your learning materials on mobile or on your TV. The courses themselves usually include articles to read, on-demand audio, supplemental resources and on-demand video. Some offer certificates of completion, though Udemy is more of a resource for boosting usable skills than a place to gain formal education credentials. Udemy credentials aren’t going to look the same to an employer as a traditional college degree from a certified institution! However, you can learn all sorts of skills without having to shell out the big bucks: Udemy courses can be priced between around $10 and $200, but frequent special offers often place many of the courses at the lower end of the scale – so keep a look out for them! Course topics range from music to language to business. This means Udemy is chock-full of courses to help you achieve your freelance goals. 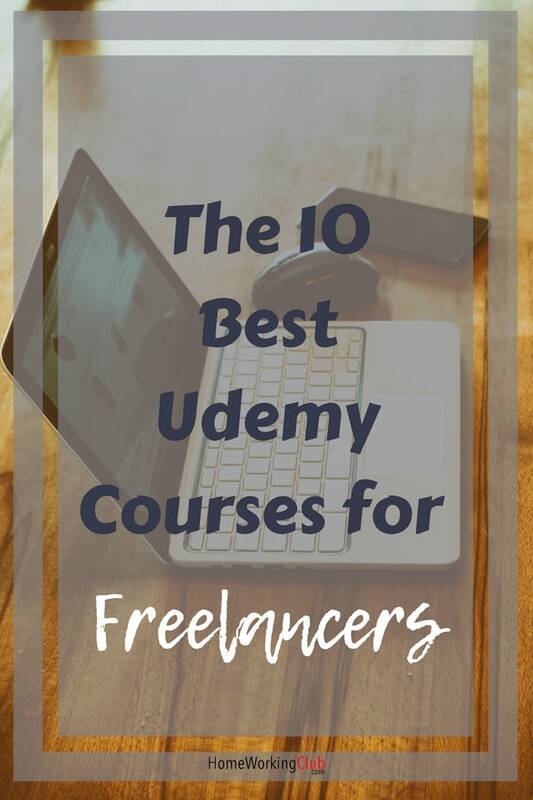 Below, we list the top ten best Udemy courses for freelancers, found after some serious research! If you’re just starting out as a freelancer, there’s a lot to learn: getting clients, completing projects and managing a portfolio. This course covers all of that through its 5.5 hours of on-demand video and three articles. It’s run by Jordan Hudgens, a CTO at DevCamp, a coding course that runs around the U.S. He leads instruction and manages the curriculum. Hudgens has also generated over $295,000 annual revenue in his freelance development businesses. As such, people say that the course is very focused on building a business as a programmer / developer. However, reviewers also say the course has a lot information everyone can use, like information on proposals, invoices and client relationships. Another reviewer praises the instructor for covering overall concepts, instead of just to-do lists, so it’s a good course if you like learning that way. Find out more about Freelance Bootcamp here. Copywriting comes with its own specific rules that many colleges don’t even seem to offer courses in. So enterprising copywriters are forced to find their own instruction. That’s where this high-rated option comes in, making it one of the best Udemy courses. The course is broken down into four parts. Part one includes a fast start, including topics such as writing your first article. Part two goes into sales copy, expert copy and other in-depth topics. Part three covers more pro skills. Part four covers boosting income and getting clients through your website. The course covers specifics like conducting phone interviews and understanding tone of voice in your writing. The course itself has 1.5 hours of on-demand video, 2 minutes of on-demand audio, four articles and 17 supplemental resources. It’s taught by Len Smith, a copywriter of 20 years who has run his own business, and Sean Kaye, an enterprise technologist and online marketing expert. Reviewers state that the course is comprehensive with real-world tips and leads. Lectures also come with helpful PDF notes. Find the “Being a Freelance Copywriter” course here. These days, there’s no ignoring Upwork if you’re a freelancer. (See this article for some of our own tips for using Upwork successfully). While not the only way to land clients, it’s a major website where people go to find freelancers with the skills they need. So this guide to learning Upwork is one of the best Udemy courses to check out. As a bidder site, finding clients on Upwork is a certain skill in and of itself. This course covers how to build a great Upwork profile and how to find the best clients with the highest-paid jobs. The course itself has 1.5 hours of on-demand video and eight supplemental resources. The course is taught by Tim Hallowell, an Upwork Top Rated Freelancer. Reviewers like the tone and presentation in the video, and say that he really helps with becoming a freelancer in today’s digital market. One reviewer says that it saved him a lot of time planning Upwork strategies and helped him just dive right in. 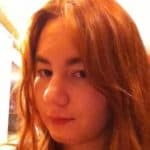 Find this useful Upwork course here. As a freelancer, one of the hardest things you’ll have to learn and manage is your own marketing. It’s easy to hate it and make a half-hearted effort at it, which will hugely reduce your chances of success. This course sets you on the right path, whether you’re just starting out or have been at this awhile and could use the boost in marketing skills. The course itself covers developing a personal brand, standing out from the competition, how to build relationships and strengthen your network, making money in a way that aligns with what you love, and how to market yourself in ways that work for you personally. It contains 1.5 hours of on-demand video. It’s taught by Jacqui Moore, a business post-grad, former VP of production for MTV, business founder and a professional freelancer. The course is based on “Get the Gig!,” a seminar that was presented in New York as part of the Freelancers Union speaking series. The presenter’s style is easy to listen to, with relatable examples and helpful worksheets and tasks. Find the “Get the Gig!” course here. This course is devoted to people who want to become a freelance designer or developer. The course focuses on starting that “six-figure” business, finding projects and making a high-quality online profile. It comes delivered as three hours of on-demand video. The course is taught by Jamshaid Raza, who has been freelancing for over five years. Beyond that, he also has over 10 years of experience in computer graphics and web and UI/UX design, and has completed over 90 projects for worldwide clients. Reviewers state that enjoy the presenter’s experience and knowledge. 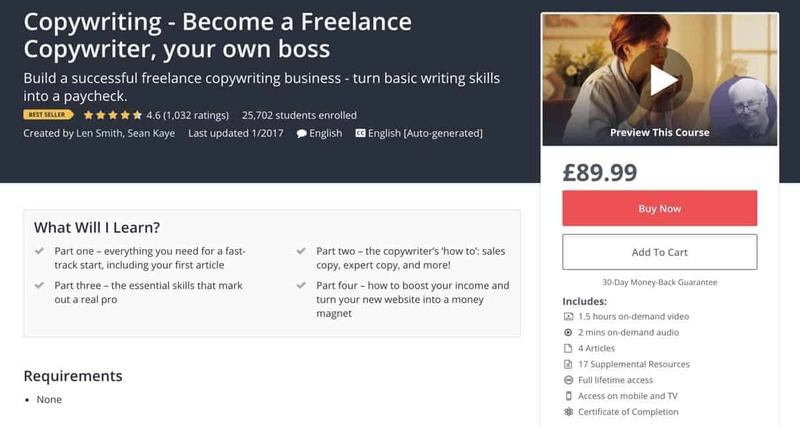 As part of the course description, the instructor states that he shares the problems he has faced as a freelancer, and how to overcome those issues. He also covers how to turn clients into long-term customers. The course also covers freelance platforms and how to work with the rating system so you can become top rated. 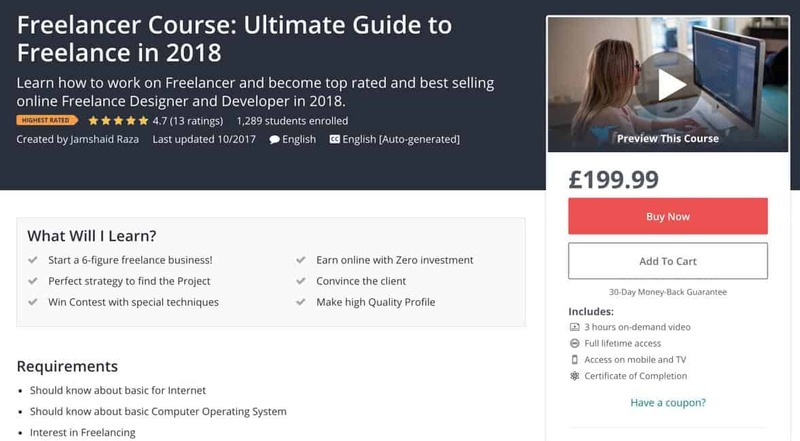 Find this freelancer course here. Do you run a freelance writing businesses? Or do you have writing to do as part of your other freelance / home working duties? This course covers ways to boost your writing skills and make them more efficient – a good way to boost your hourly earnings. The course itself is incredibly detailed. It covers how to write persuasive marketing copy, writing viral headlines, organizing ideas, and how to generate ideas and hacks for high-quality content. It includes 1.5 hours of on-demand video, one article and three supplemental resources. The course is taught by Tyler Speegle, a professional writer and freelance blogger. He has contributed to top sites like The Blaze and the Huffington Post. Reviewers state that his course took their blogging to the “pro level.” They also liked the tools Tyler provided for boosting writing skills, such as new research tools. Even experienced copywriters say that he mentions some resources they didn’t know about. Find the writing tools and hacks course here. Since freelancing is so digital these days, it can’t hurt to brush up on some computer skills if you feel you’re lagging behind in that area a bit. If you want to know whether you are, check out our own computer fundamentals for freelancers article. The course uses two hours of on-demand video to teach basic skills. Some of the topics covered include system maintenance and different features in the Windows ecosystem. This course even happens to be free at the time of writing! Reviewers also like the presentation; it’s very simple and easy to understand for even the most novice of computer users. It comes as two hours of on-demand video. Examples and illustrations help with the learning experience. If you’ve never had a computer course or need to brush up on skills, this is a good basic place to start. Find this great computer course here. Limited cash? One of the great things about freelancing is how “low overhead” it can be. 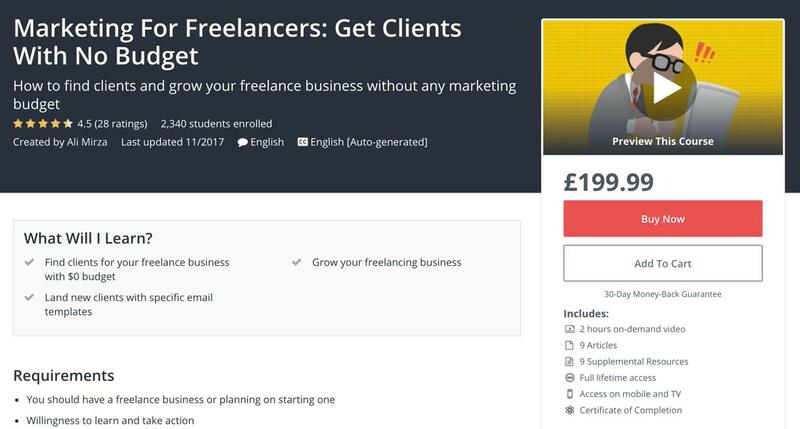 This course dives into how to find freelance clients with no budget, making it one of the best Udemy courses for people needing more clients during lean times or just starting out after a layoff. The course itself is delivered in two hours of on-demand video, nine articles and nine supplemental resources. It covers how to land clients using specific email templates. The course is taught by Ali Mirza, who has been working in social marketing for over 10 years and founded iSocialYou. Reviewers state that they like how he offers step-by-step explanations. They also state that he has a clear and well-paced presentation style. A reviewer also mentions that he covers a lot of different free ways to find clients, like Facebook groups, local events and even Craigslist. Find this invaluable marketing course here. This freelancing course offers general skills on how to run your business. It covers topics like professional client communication, how to make a better profile, business organization tips, and how to be a great freelancer overall. The course comes delivered as a one-hour on-demand video, five supplemental resources and a practice test. It’s taught by Bob Francis, a life coach and entrepreneur. Reviewers like that he gives a good overall look at the freelance life, making it one of the best Udemy courses for people who are new to freelancing. This course can also be used to re-position yourself to look more professional, as one reviewer states. Find out more about Success and Freelancing here. If you’re just starting out in the freelance writing world (and judging by the HomeWorkingClub mailbox, a lot of people are!) you’ll likely benefit from a freelancing course that is made just for you. This beginner class is one of the best Udemy courses. It’s delivered through 1.5 hours of on-demand video and eight supplemental resources. The course requires a good command of written English to start. The course itself is very comprehensive. It covers how to find clients, creating a profile, finding good niches and proposal writing. It also goes over tools that can help with freelance writing jobs. It’s taught by James Bruce, a professional author, screenwriter and teacher. Reviewers state that the course covers a good range of bases, from different types of writing to how to establish yourself professionally. The course can also help people diversify for more income opportunities. Another reviewer comments that the course helped him to outline all the things he needed to consider before starting his freelance business. Find this well-recommended freelance writing course here. There are lots of great training resources out there, including completely free options from the likes of Google and Apple! Find more options in this previous article.